Better programming at a better value makes DISH the best solution for your business. Packages from DISH Business include all the latest movies, news, sports and much more. Learn more about our different packages today! Lock in Your Price for 2 Full Years! Become the Pro Sports, College Sports, and every Major Sporting event destination! DISH has you covered with the sports programming you need. Upgrade to America’s Top 120 Plus for the best college sports action, and don’t forget to add our Business Multi-Sport Pack for great pro coverage such as NFL RedZone, MLB StrikeZone and more! The BEST value for all day shows, up-to-date news, education, music, sports, and much more. Every waiting room needs the BEST TV ENTERTAINMENT at a great VALUE. HD entertainment for your office or breakroom at a price that makes sense to your balance sheet. Check out America’s Top 120 package from DISH and starting saving today! Give your customers a pleasant shopping experience with latest in television entertainment. Engage your customers will the best entertainment from DISH. Check out America’s Top 120 package and starting saving today! And don’t forget about our music options like SiriusXM to spice up your atmosphere. Watch your favorite shows in HD — FREE! Make sure you’re experiencing ture HD on your HDTV with DISH HD programming and receivers. Get standard installation in up to 6 rooms, FREE. Ask about same-day service. 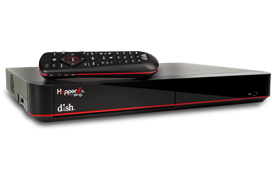 The new Hopper® Smart HD DVR comes in every package and includes over 13 days of recording storage. Easily watch your favorite shows On Demand and record multiple shows at once.